When in Uruguay, do as the Uruguayans do… drink maté. Maté is everywhere. It is similar to green tea. The taste is different, and takes a little getting used to, but it’s the same concept. Hot water with some amount of leaves or ground up foliage and a way to drink it without eating the foliage. I’m a huge fan of green tea and maté is a readily available drink close to green tea in Uruguay. I didn’t want to drink maté out of a regular glass or cup. I wanted to drink it like Uruguayans do. To do that, it requires the correct items and not one of the collectors glasses that we have from a whisky box set. 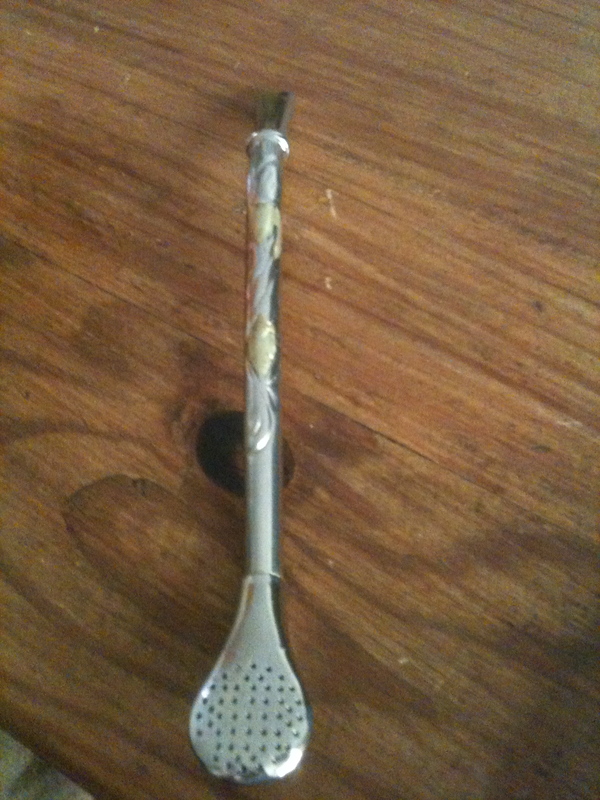 Bombilla, the metal straw that looks like a spoon on one end with holes in it to act as a filter of the maté. 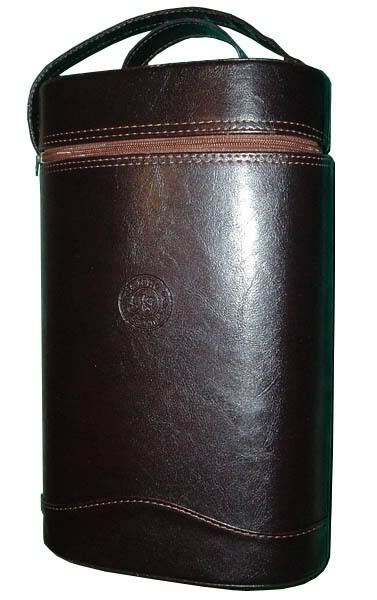 Thermos, to carry the hot water around since immediate access to hot water is very important. Matera, a leather satchel to carry everything around in. Some people carry a matera around with them, but most people tuck their thermos under an arm and carry their gourd in the same hand of the arm with a thermos, leaving one hand free to do tasks. 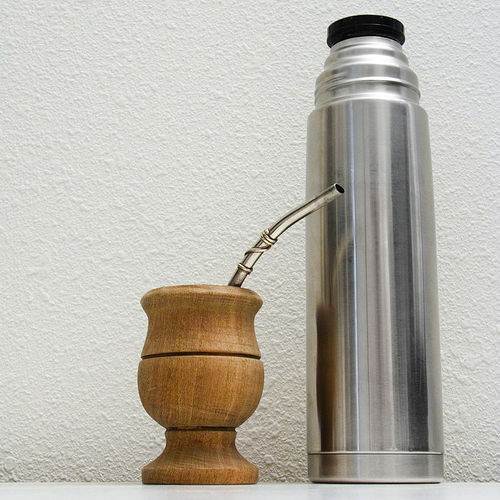 Whenever we are outside, at least 1/4th of the people we see have a thermos tucked under one arm, while using the hand of that same arm to hold their maté gourd, full of yerba maté, hot water, and a bombilla. And now, some maté information! Appropriate times to drink maté: all day. Seriously, there is never a bad time to drink maté. You’re not cool if you’re not carrying around a thermos and maté. Appropriate places to drink maté at: Everywhere! I saw a guy struggling with 5 full grocery bags on one arm leaving a store, thermos and maté occupying the other while trying to take a sip without spilling or dropping anything.There is no way this guy would ever commit a party foul and spill a beer in hand, even if he fell down a flight of stairs. Hopefully he doesn’t fall down a flight of stairs though. The beach, even if it’s 100 degrees out, people are enjoying their super hot maté. The bus, if you sit next to someone with maté on the bus and strike up a conversation, you might just get some maté. La Rambla, the numbers increase of people drinkin maté at the La Rambla (street and large sidewalk next to the ocean/river). Seriously, it often gets close to 1 out of every 2 people have maté in hand around 7-8pm. The ones without maté are running or young children. Walking on the streets, it seems important to never lose an opportunity to drink maté. In case you are out and run out of hot water, you can refill your thermos with the correct temperature water at many gas stations, restaurants, bars, and more. We have a maté dispenser on the kitchen wall in our house. Push the gourd into the pole at the bottom and maté falls into the cup. With all this maté going around, I’ve wanted to buy a maté gourd, bombilla, and thermos since I’ve been down here. 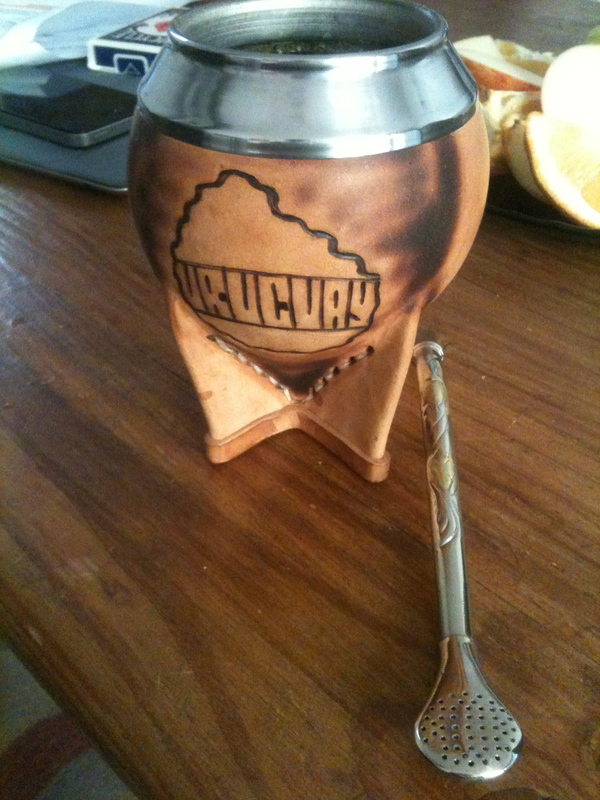 When in Uruguay, do as the Uruguayans do and drink maté! 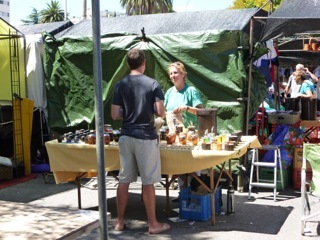 This past Sunday, we went to the local market at Parque Rodo and I saw some maté gourds that I liked. After walking around to see what the market was about, I stopped and started talking to a very nice lady that was selling maté gourds and bombillas. She didn’t speak english except for a few words such as horse, english, and United States, and I felt pretty comfortable understanding and talking with her about the maté gourds. About 10 minutes later, I walked away with my very own maté gourd and bombilla at a good price. There were different sizes, different designs, and even gourds that were ceramic on the inside, but I chose to buy the traditional maté gourd with a logo of Uruguay on it. I’m sure only tourists have Uruguay on their maté gourd, but I liked it and figured people can pick out that I’m a tourist pretty quickly. I was told that I needed to put cold water and maté in the gourd for 2 days to let it soak in and then lightly scrape the inside to remove the loose part of the gourd. This is supposed to take the bitterness out of the gourd. Everywhere online said to use hot water so I followed her directions and then the hot water directions. 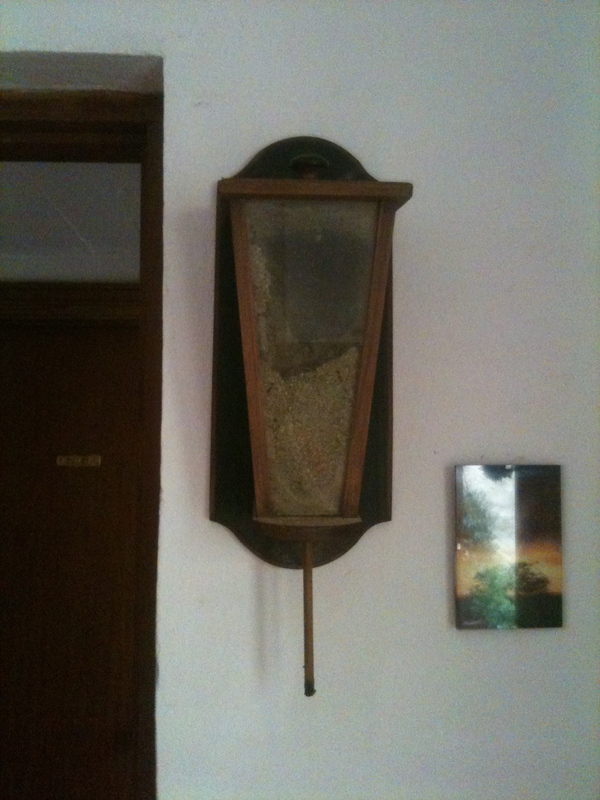 So, here is my maté gourd and bombilla. I’ll buy a thermos and take my maté on adventures when I am more conversational in spanish. For now, I’m content with just drinking maté in our house. 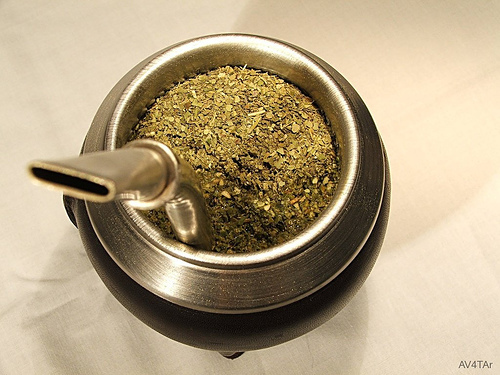 This entry was posted in Adjusting, Food, Living Conditions and tagged bombilla, mate gourd, uruguay mate, uruguay traditions, yerba mate by Matt. Bookmark the permalink. can you smoke this too and does it have cocain in it? haha. Not going to try and no, it doesn’t. Yep, thanks for the heads up! It’s super laid back and maté is everywhere. You were absolutely right. 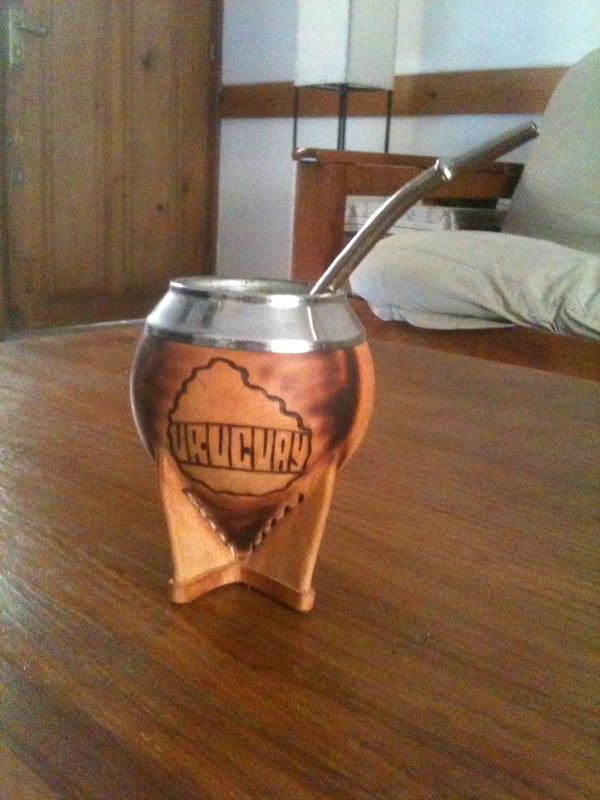 If u are traveling around the world, and u see a person drinking mate, I assure u that he is uruguayan….